Collecta at St. Nicholas in Carcere. Station at St. Anastasia. In the Middle Ages the church of St. Nicholas was one of the most central and important of the Roman churches. The funeral ceremony of Urban II was held here; the name in carcere (in prison) also goes back to the Middle Ages. St. Anastasia is commemorated in the second Mass of Christmas; her feast at Rome is perhaps older than the feast of Christmas itself. The church is said to mark the spot of the martyr’s dwelling; she was a holy widow martyred under Diocletian. The Lucernare (Psalm 140) of the Gradual is noteworthy. In oriental liturgies it belongs to the Night Office. We must bear in mind that for many centuries Rome did not use the canonical Office of Vespers, its place being taken by the stational Mass celebrated either during Lent or on the eve of some solemn feast, at the very hour of sunset, when the Eastern Church was reciting the Office of the Lucernare. We learn from the Mass the importance of prayer and meditation, and how careful should be our preparation to approach the sacraments. The Epistle: Lent is a time of fast and prayer and good works; Lent is the time when God is near to us and eager to forgive us, if we put aside our evil thoughts and forsake the way of sin. The Gospel: We must cast sin out from our minds and hearts, as Jesus cast out the sellers from the Temple, and receive the teaching of Christ with the simplicity of children of God. 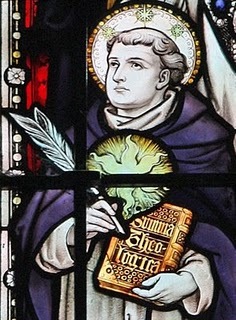 St Thomas Aquinas: today is the traditional feast day of St. Thomas Aquinas, commonly called the Angelic Doctor, who died on this day in the year 1274 at the Cistercian Abbey of Fossanova, while traveling to attend the Second General Council of Lyons. St Thomas was an Italian Dominican friar, Catholic priest, and Doctor of the Church. He was an immensely influential philosopher, theologian, and jurist in the tradition of scholasticism, within which he is also known as the Doctor Angelicus and the Doctor Communis. St Thomas’ great contribution to the liturgy of the Church is of course the Office of the Feast of Corpus Christi, which he composed at the behest of Pope Urban IV in 1264, when the feast was formally promulgated by the Pope for the entire Latin Church. Look down upon Thy household, O Lord, and grant that our minds may be made glow by the desire of Thee, which have been chastened by the tormenting of their bodies. Through Jesus Christ our Lord, Who liveth and reigneth with Thee in the unity of the Holy Ghost, one God Forever and ever. R.Amen. O God, Who enlightened Your Church with the wondrous learning of blessed Thomas, Your Confessor, and enriched her through his holy life, grant us, we beseech You, both to understand what he taught and by following his example to do what he did. Defend us, we beseech Thee, O Lord, from all dangers of mind and body; that through the intercession of the blessed and glorious ever Virgin Mary, Mother of God, together with blessed Joseph, Thy blessed apostles Peter and Paul, and blessed N. (Here mention the titular saint of the church), and all the saints, mercifully grant us safety and peace; that all adversities and errors being overcome, Thy Church may serve Thee in security and freedom. Through our Lord Jesus Christ, Who livest and reignest, with God the Father, in the unity of the Holy Ghost, one God For ever and ever. R. Amen. Lesson from Isaias the Prophet. In those days the prophet Isaias spoke, saying, Seek ye the Lord while He may be found, call upon Him while He is near. Let the wicked forsake his way, and the unjust man his thoughts, and let him return to the Lord, and He will have mercy on him; and to our God, for He is bountiful to forgive. For My thoughts are not your thoughts: nor your ways My ways, saith the Lord. For as the heavens are exalted above the earth, so are My ways exalted above your ways, and My thoughts above your thoughts. And as the rain and the snow come down from heaven, and return no more thither, but soak the earth and water it, and make it to spring, arid give seed to the sower and bread to the eater; so shall My word be which shall go forth from My mouth: it shall not return to Me void, but it shall do whatsoever I please, and shall prosper in the things for which I sent it; saith the Lord almighty. Let my prayer be directed as incense in Thy sight, O Lord. V. The lifting up of my hands as evening sacrifice. At that time, when Jesus was come into Jerusalem, the whole city was moved, saying, Who is this? And the people said, This is Jesus the prophet, from Nazareth of Galilee. And Jesus went into the temple of God, and cast out all them that sold and bought in the temple, and overthrew the tables of the money­changers, and the chairs of them that sold doves, and He saith to them, ” It is written, My house shall be called the house of prayer, but you have made it a den of thieves.” And there came to Him the blind and the lame, in the temple; and He healed them. And the chief priests and scribes seeing the wonderful things that He did, and the children crying in the temple, and saying, Hosanna to the son of David, were moved with indignation, and said to Him, Hearest Thou what these say? And Jesus said to them, Yea, have you never read, Out of the mouth of infants and of sucklings Thou hast perfected praise?” And leaving them, He went out of the city in Bethania and remained there. In Thee, O Lord, have I hoped: I said: Thou art my God, my times are in Thy hands. Be appeased, we beseech Thee, O Lord, with the gifts we offer, and defend us from all dangers. Through our Lord Jesus Christ Thy Son. Who liveth and reigneth with Thee in the unity of the Holy Ghost, one God Forever and ever. R.Amen. May the pious prayer of holy Thomas thy Confessor and illustrious Doctor be not wanting to us, O Lord, but make our offerings acceptable to thee and ever win for us thy mercy. Graciously hear us, O God our Savior, and by the virtue of this sacrament protect us from all enemies of soul and body, bestowing on us both grace in this life and glory hereafter. Through our Lord Jesus Christ, Who livest and reignest, with God the Father, in the unity of the Holy Ghost, one God For ever and ever. R. Amen. When I called upon Thee, Thou didst hear me, O God of my justice: when I was in distress, Thou hast enlarged me: have mercy on me, O Lord, and hear my prayer. We beg, O almighty God, that we may lay hold upon the effect of that salvation whose pledge we have received through these mysteries. Through our Lord Jesus Christ, Who livest and reignest, with God the Father, in the unity of the Holy Ghost, one God For ever and ever. R. Amen. May blessed Thomas thy Confessor and illustrious Doctor intercede for us, O Lord, that this thy sacrifice may obtain for us salvation. May the oblation of this divine sacrament cleanse and defend us, we beseech Thee, O Lord, and, through the intercession of the blessed Virgin Mary, Mother of God, with blessed Joseph, Thy blessed apostles Peter and Paul, blessed N. (here mention the titular saint of the church), and all the saints, purify us from all our sins and deliver us from all adversity. Through our Lord Jesus Christ, Who livest and reignest, with God the Father, in the unity of the Holy Ghost, one God For ever and ever. R. Amen. May our prayers ascend unto You, O Lord, and banish all wickedness from Your Church. Through our Lord Jesus Christ, Who livest and reignest, with God the Father, in the unity of the Holy Ghost, one God For ever and ever. R. Amen.